When RancherMan & I found this little piece of paradise, we were smitten that’s for sure. As we looked over that old fence at the dilapidated 1880’s barn and overgrown property, we saw something beautiful. We saw where our future would be found. We saw HOME. LOTS of thorns! This tree’s trunk is covered with an almost impenetrable mass of thorns all along the trunk and all along the branches too. And these aren’t regular sized thorns y’all. Some thorns are right at a foot long! These thorns are tough too. They’ll easily go through a work boot or flatten a tractor tire in a heartbeat. We’ve had cattle that were injured after stepping on those thorns. Want to cut them down? HOW??!! How do you get the chainsaw through the thorns. And once you do, how do you grasp the cut limb to haul it off? And do you really want to broadcast those thorns as you drag a limb away? (I’ll answer for you. No, no you do not!) Let me tell ya, much bloodshed has happened for me and RancherMan as we vow to rid our property of each and every one of these ‘Satan Trees’! OK, we hate the trees y’all. It’s our fervent desire to one day rid our property of Every. Single. One. But they do have some useful features. The blossoms of the honey locust tree are favored by honeybees (and other pollinators as well). It’s said that honey made from the blossoms of the honey locust is some mighty-fine honey indeed. We’re beekeepers so that certainly appeals to us. 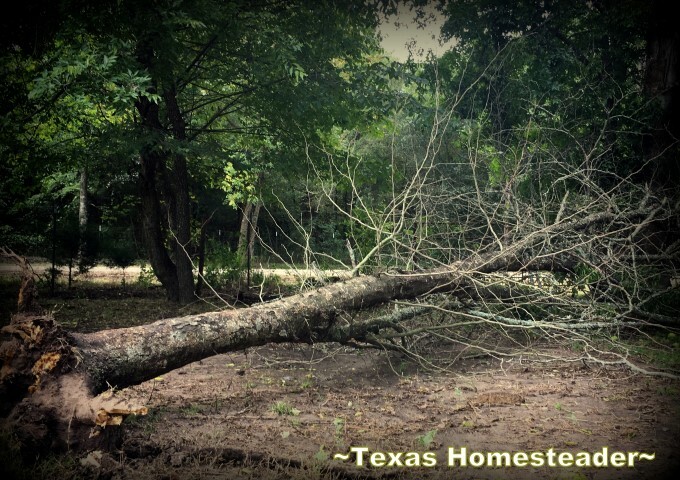 RancherMan & I recently harvested a Honey Locust that had died but remained standing. As it stood, it seasoned. Then one day a heavy wind blew it down, the roots no longer able to support it. But since it remained standing until now the wood was still in very good shape for firewood. It’s very dense and it makes a nice hot fire that lasts a long time. So RancherMan & I CAREFULLY cut away the fanning limbs to get to the trunk. When nothing remained but the trunk I ran a sharp blade along it to dislodge most of the thorny masses. 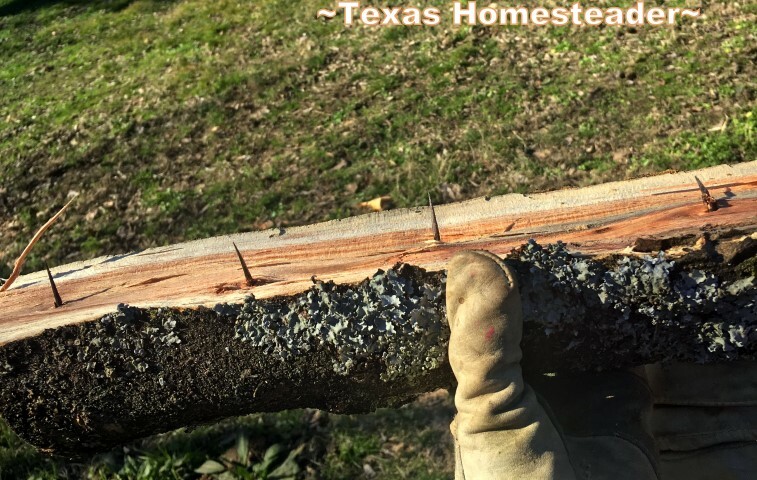 Then RancherMan cut the trunk into firewood-log-sized chunks and we split the logs. DANG, there are even thorns INSIDE the wood! OK I’ll admit it. The tree is very pretty. Its leaves are dainty, the fall color is nice and the tree itself makes a nice shade tree too. So although we’re still anxious to one day rid our property of thousands of these trees, at least in the meantime they do serve some purpose. C’mon by & sit a spell! Come hang out at our Facebook Page or follow along on Pinterest, Twitter or Instagram. If you’d like to receive an email each time a new blog post goes live Subscribe to our blog! 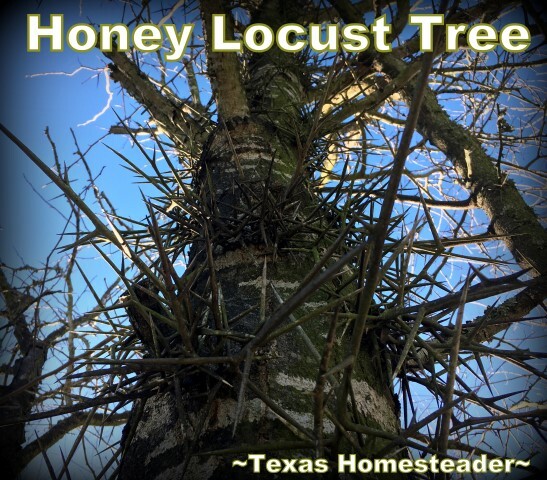 This entry was posted in Blog Posts and tagged Native Plants & Wildlife on January 17, 2019 by Texas Homesteader. As a fellow land owner with many of these trees we found last year the bees did like the blossoms of Spring. We plan to remove all the females that create the seed pods, use these for firewood (after many many months of aging) and keep the males around for shade and beauty. We also have found as the tree ages we can twist off the lower thorns to keep from snagging them or the little ones getting snagged by one when playing. Put in a bucket and dump in the fire pit. Great pic on the inside that is a new sight I have not seen. Glad I don’t have these trees on my place! Wow and we have always whined about the masses of blackberry that we fight to reclaim land. I believe I have heard that Luther Burbank (of plant fame) thought that the berries were so delish (no argument there) that we should have them in the US and brought them to the US . Huge masses of very thorny (not like your locust) canes with big sweet berries great for jelly – too seedy for jam. They and English ivy (we don’t have that on our place thank heaven) are just horrible. Here’s a blurb about them from the internet: Even the origins of Himalayan blackberry are almost mythic: In the late 1800s, botanist/entrepreneur Luther Burbank brought the plant to his California farm in the hope of selling it far and wide. Burbank was a constant experimenter; his creations include the Shasta daisy, elephant garlic, and the predecessor to the Russet potato. I doubt anyone in their right mind would buy them!! !